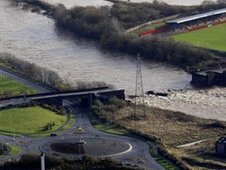 Freezing conditions contributed to the success of a £1m clean up operation at a flood-hit port in Cumbria, council officials have revealed. Workington Port was blocked by tonnes of debris after the November floods which devastated the county. A round-the-clock dredging operation began on Christmas Day and finished ahead of schedule on 8 January. Sub-zero temperatures reduced water flow, giving calmer waters for the dredgers to work in, officials said. Dredging teams deposited around 120,000 metric tonnes of debris further out to sea - the equivalent of shifting 24 Olympic-sized swimming pools full of boulders, rocks, trees, silt and general debris. Underwater checks carried out revealed shipping channels have now been successfully cleared and the port is capable of accepting its upper limit. Cllr Tony Markley, Cumbria County Council's cabinet member responsible for economic development, said: "Getting the port dredged and back to normal so soon is another key achievement in the flood recovery operation. The Port of Workington is a vital gateway for supplies for many businesses in West Cumbria and beyond. "People have been working flat out to get this work done and at the same time have been keeping the port open for business." Further works will be required on the river side of the harbour, and will include rebuilding the retaining wall at the end of Merchant's Quay, replacing river bank supporting walls, and repairing the Old Railway footbridge and cycleway which was damaged in the floods. The repairs will have no impact on the current operational ability of the port, but current estimates predict the repair bill could be up to £5.75m.